A memorial plaque has been unveiled for the last men executed in France for homosexuality. The memorial stone will be officially unveiled tomorrow by the Mayor of Paris, Anne Hidalgo. 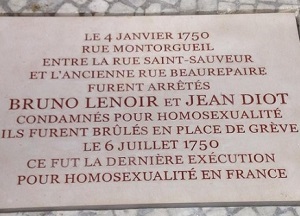 It is in honour of Bruno Lenoir and Jean Diot, who were burned alive under the country’s anti-gay law in 1750. Parisian councillor Ian Brossat told Yagg: “At 11:30pm on the 4th January 1750, at the crossroad of rue Montorgueuil and rue Saint-Saveur, Bruno Lenoir, a cobbler in his 20s, and Jean Diot, a 40 year-old servant, were arrested for being homosexuals. “Imprisoned at Châtelet, their trial and its verdict demonstrate the unremitting jurisdiction that French homosexuals faced at the time. “Following the seizure of all their possessions and money, both of them were condemned to be burnt alive at the stake in the Place de Grève and their ashes scattered.